We do think we have the best night diving in the Caribbean and those who experiece night diving with us before all agree. 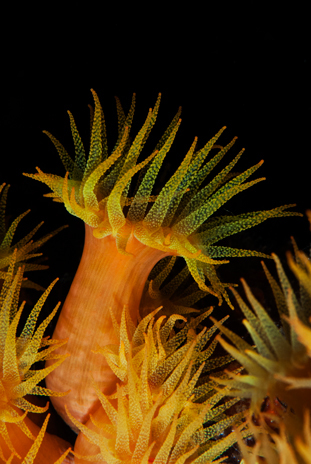 The allready beautiful wreck during the day: the Chien Tong transforms at night in orange fireworks as the cup coral polyps open to feed. Even more impressive are the vast numbers of enormous turtles who use the wreck as a hotel to sleep at night. Sometimes you have to pinch yourselve to believe what you see. We offer night diving at least once a week but on request we take you out in the dark as much as you want! We recommend you to bring your own dive light but we do rent out lights. Your first night dive? Same as diving in daytime, we take good care of you and dive in smaller groups when we/you feel like it.